The implementation of fertility desires through contraception is imperfect, resulting in unplanned births and induced abortions. The highest unplanned pregnancy rates (over two pregnancies during a woman’s lifetime) are observed in countries approaching the end of the fertility transition. Half of these unplanned pregnancies end in abortion. As shown here by John Bongaarts and John Casterline, many women are unsuccessful in controlling their fertility through contraceptive practice. Using demographic survey data from a large set of developing countries, supplemented by estimates of induced abortion rates from other sources, we estimated the incidence of unintended pregnancy at different stages of fertility transition. Decline in the desired number of children is assumed to be a key driver of increased contraceptive use. Unplanned pregnancies occur when contraception is not practiced (because of obstacles to use or because sexual activity was not anticipated) or when it fails. The result can be either an induced abortion or a birth. Among the latter, we can distinguish births that are either mistimed (i.e. occurring sooner than desired) or unwanted (i.e. in excess of the desired number of children). Unplanned pregnancies can thus be classified into three categories: induced abortion, mistimed birth, unwanted birth. We address two questions: first, what is the relative incidence of these three outcomes of an unplanned pregnancy? And, second, how does the incidence of each vary according to the “stage of the fertility transition”, as measured by the level of desired fertility? To quantify the population-level incidence of these three types of unplanned outcomes, we calculate various “total” rates, complemented by rates of planned outcomes. These rates measure the average number of outcomes of various types that women would have over a lifetime if they experienced the current age-specific rates of their population. For example, the total fertility rate (TFR) measures the lifetime number of births at current age-specific rates. Other total event rates that we estimate are the total pregnancy rate (TPR) and the total abortion rate (TAR) with TPR=TAR+TFR. The TFR equals the sum of wanted and unwanted births TFR=TFRw+TFRunw, and the wanted TFR equals the sum of mistimed and planned births TFRw=TFRmis+TFRpl. Figure 1 plots the incidence of unplanned events by desired family size (DFS). The tallest set of bars represents the total unplanned pregnancy rate. This total consists of three components: 1. abortions (TAR); 2. unwanted births (TFRunw); and 3. mistimed births (TFRmis). The bars for TFRunpl and TFRmis show a marked inverted-U-shaped pattern, with the lowest values in countries with high or low desired family size. In countries with a DFS near 2, women average 2.3 unplanned pregnancies over their lifetimes, which equals the sum of 1.1 abortions, 0.6 unwanted births and 0.5 mistimed births. Mistimed births exceed unwanted fertility in most countries except in the latest transition stage. The total abortion rate (the difference between the blue and black bars in Figure 1) in the earliest fertility transition countries (with low desired family size) is about half the rate in the late transition countries. There are several reasons for this: 1) limited demand for abortion due to high desired family size; 2) low availability of abortion methods and services; and 3) low contraception failure rates due to low contraceptive prevalence. Later in the transition, these factors all rise, thus causing abortion rates to be higher. Figure 2 provides another perspective by plotting various unplanned outcomes as a percentage of all pregnancies. The percentage of unplanned pregnancies is inversely related to DFS, and the differentials by DFS group are large. Countries with high desired family size have relatively few unplanned pregnancies (around 10%) and the large majority of pregnancies are planned and consist of births. In contrast, in countries at the end of the transition, with a DFS of between 2 and 3, 59% of pregnancies on average are unplanned (12% mistimed births, 16% unwanted births and 30% abortions). Our main finding is that unplanned pregnancy rates are substantial in all countries but are typically highest in mid-transition countries. Furthermore, the unplanned proportion of all pregnancies is highest in countries with the lowest desired family size. This pattern has a simple explanation. In societies at the beginning of the fertility transition, most of women’s reproductive years are devoted to bearing wanted children, so unplanned pregnancies are relatively uncommon. However, as desired family size declines, the number of years devoted to having wanted children decreases, and the number of years at risk of unplanned childbearing rises correspondingly. Ceteris paribus this produces an increase in unplanned pregnancy rates over the course of transition. Offsetting this upward pressure on unplanned pregnancies is a rise in contraceptive use. At the extreme, no unplanned pregnancies would occur if all women who wished to avoid pregnancy practiced 100% effective contraception. In reality, few women achieve this level of control of reproduction. This rise in contraception offsets the upward trend in unplanned pregnancies from expanding years of exposure, thus explaining the decline in unplanned pregnancies later in the transition, visible in Figure 1. At the same time, in many societies abortion becomes a more viable option, reinforcing the decline in unplanned births. The fertility transition, in which the average number of births per woman declines by as much as five births, is commonly viewed as a transition from uncontrolled to controlled fertility. But while a high level of birth control is characteristic of low-fertility societies, it does not follow that unintended fertility necessarily falls to minimal levels in such societies. When women desire just a few births during their childbearing years, the risk of unintended fertility is high, because of the many years of fecund exposure during which pregnancy is not wanted. Put otherwise, high rates of wanted fertility in pre-transition and early-transition societies remove many reproductive years from the risk of unintended pregnancy. Somewhat paradoxically, as fertility transition progresses, the exercise of fertility control and the risk of unintended fertility both increase. Even so, higher rates of unintended fertility do not automatically follow from higher risk of unintended fertility. Consistent and effective practice of birth control (induced abortion, contraception) can offset the higher risk. However, the empirical evidence presented here demonstrates that this risk is far from completely offset in contemporary developing countries. 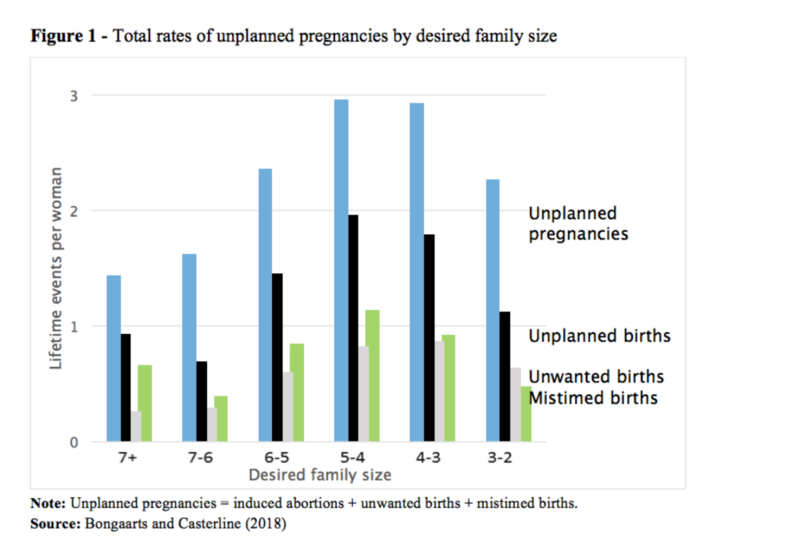 In those with the lowest desired family size (less than three children desired), the unplanned pregnancy rate exceeds two per woman, and the unplanned birth rate exceeds one per woman, i.e. a substantial departure from entirely successful achievement of fertility desires. 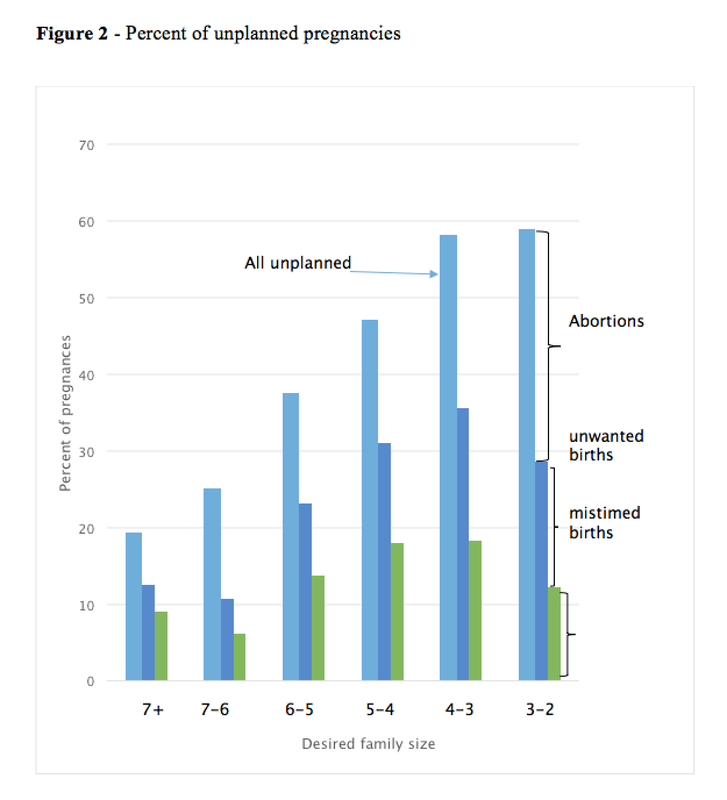 Moreover, the data reveal that the proportion of unplanned pregnancies is highest in societies with the lowest desired family size – more than half of pregnancies are unplanned, and almost one-third of pregnancies yield an unwanted or mistimed birth. Even as fertility declines, the need to address obstacles to consistent and effective birth control remains high: if anything, this need increases. Certainly, the justification for investment in low-cost access to birth control extends into the later stages of fertility transition and, for that matter, persists in post-transition societies. Bongaarts John and John Casterline. 2018.“From Fertility Preferences to Reproductive Outcomes in the Developing World. Population and Development Review 44(4). Rutstein, Shea and Guillermo Rojas. 2006. Guide to DHS statistics. Demographic and Health Surveys, ORC Macro, Calverton, Maryland . Sedgh, Gilda, Jonathan Bearak, Susheela Singh, Akinrinola Bankole, Anna Popinchalk, Bela Ganatra, Clémentine Rossier, and Caitlin Gerdts. 2016. “Abortion incidence between 1990 and 2014: global, regional, and subregional levels and trends”. Lancet 2016; 388: 258–67. United Nations. 2017. World Population Prospects: The 2017 Revision. New York: Department of Social Affairs, Population Division, United Nations.